Over the course of four meals and one year, Saison has grown from a Michelin one-star restaurant that lacked a strong identity (aside from its cult status as an ambitious pop-up) to a clear, and deserved, two-star vision. The ingredients and cooking were always strong but the initial ideas meandered and missed a cohesive force. The introduction of the hearth focused the food – gave it a conceptual backbone from which to explore – and help distinguish the cooking with, ironically, a very primitive technique. 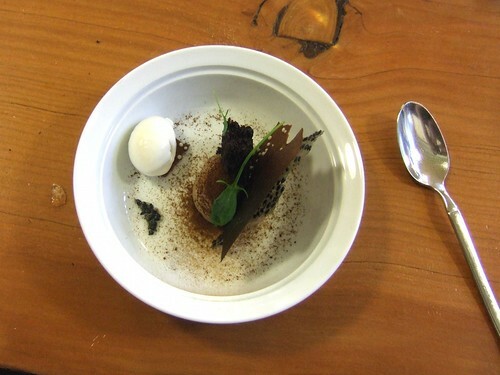 3 Winning the Food & Wine Best New Chef 2011 is a great case of the magazines getting it right. 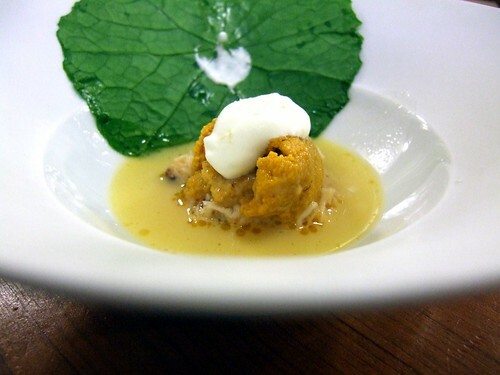 The pictures below are from two meals, the dish names mine, when remembered. There were more dishes than pictured. With Quince, Saison is my favorite place to eat in San Francisco. Skenes has always had a reputation for great composed seafood dishes, even during his beginning days at Chez TJ in Mountain View. 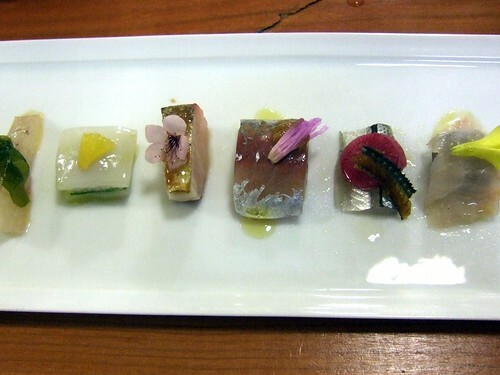 Restraint first, the differing cuts of sashimi relied as much on bitter greens and flowers as it did on cures and drops of acid for flavor. 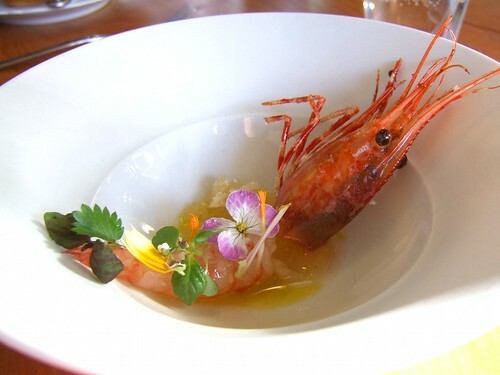 Bright, but not demanding, the tomato and chrysanthemum consomme perked the mucinous raw prawn body and tail; while providing a foil for the fried head. 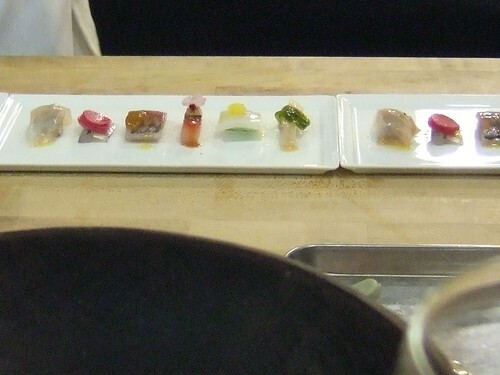 The awareness of textures, from paper thin to gelatinous to crisp, is a constant under-current in most dishes. Environment is also a theme at Saison, not of the noma “time and place” narrative, but of exploring ingredients that may, or should, go together. 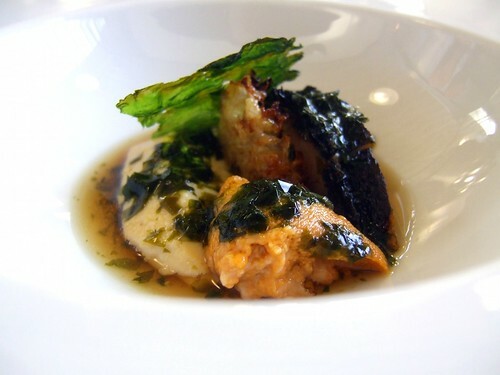 The Monterey abalone (above), charred on the hearth, was served with the sea lettuce it grew alongside. The broth was a briny and slightly herbaceous, made from the lettuce. The innocuous crisped sea lettuce leaf, perched against the meat, brought the dish together and framed it in the context of the meal. Its slight bitterness and vegetal essence, attuned by the flame, stood up to the meatiness of the abalone. 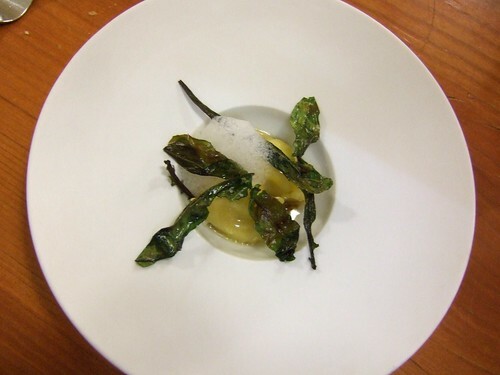 It also referenced the earlier brassicas dish, a nod from meat to vegetable. The most beautiful plate one night (below) was a wild duck, twice-cooked foie gras, cured cherry blossoms, and cherry gelee. It sat atop cherry wood, itself heated shortly to release its fragrance. And it was a stellar dish. 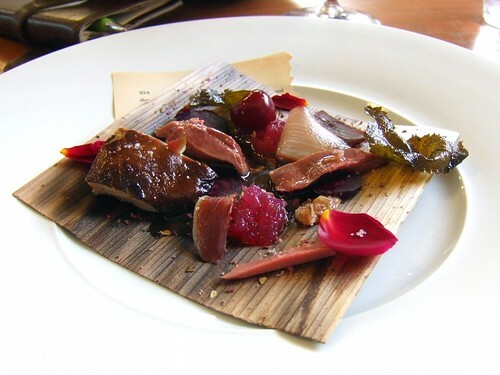 Perfumed throughout, the cherry foiled the duck’s aged gaminess – bolstered by its crackling skin and oozing fat. 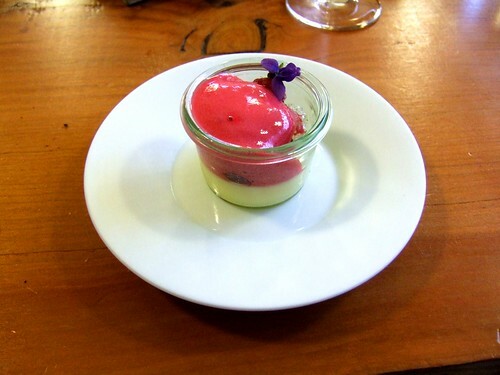 Each bite released a decided floral note that permeated but never cloyed. Skenes also has an interest in the arts of aging meat, including those served at the restaurant. He served a pigeon, a smothered Four Story Hill bird, but admitted it was not aged as long as he would prefer. Smothering keeps the blood inside the bird, adding to its richness as it ages. Dark, rich with iron and chocolate-like undertones, it was very good, better than most, but failed to reach the (impossible?) highs of Carlo Mirarchi’s Roberta’s – it lacked the full funk. Outside of Roberta’s, and a few choice dishes in various meals, dry-aging as an art seems to be largely unexplored in American fine-dining restaurants. Yes, many restaurants serve it, but few have tried to understand and exploit it. 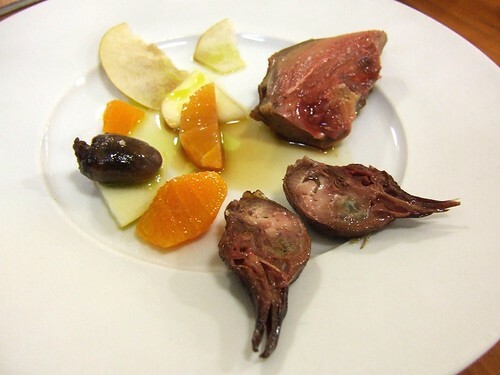 Squab, duck, beef, game, and even fish5 – there are many opportunities. 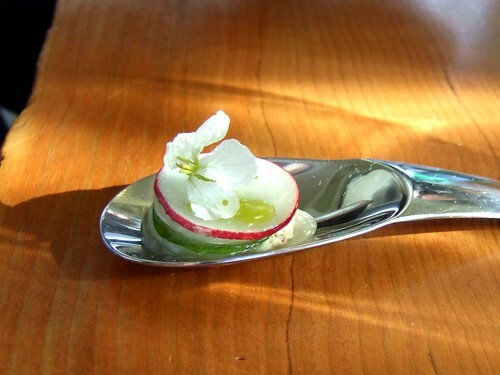 And to think Carlo Mircachi and Joshua Skenes hit it off at the Food & Wine party – the prospects of cross-pollination. Saison is a restaurant whose big idea is the small details, where execution and ingredient quality is first-rate. Its focus on hearth cooking, in a fine dining context, give it an identity, and opportunity, all its own. Imagine the possibilities, if Skenes continues down this path, when he pushes against the boundaries, like Victor Arguinzoniz with his grills, and begins fashioning his own cooking instruments. That is a tale unwritten, as of yet, but one worth dreaming about. 1 – Termed, as far as I know, by Mr Veal Cheeks on his very well-written blog. 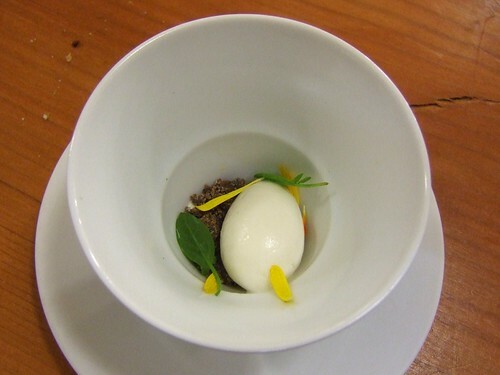 2 – Skenes and I share similar opinions on the unnecessary protein-heavy final courses of most tasting menus. My second meal finished with a beautiful small portion of heritage chicken. 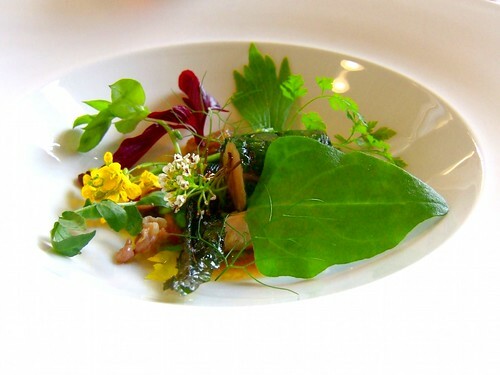 When will tasting menus be freed of their determinate paths? John Shields of Town House did not ditch the proteins but he crafted an alternate narrative – my review will come soon. Craig of Wolvesmouth and I discussed this – you should see a fun blog post soon. 3 – It might be easy to dismiss Saison as yet another Scandanavian clone, with its emphasis on the foraged and primitive, but a more apt analogy might be Etxebarri in Spain – the magical grilling man. A simple technique, on the surface, taken to an art. It may be too early to call Joshua Skenes the Victor Arguinzoniz of San Francisco but it won’t be unreasonable if the food continues on its current trajectory. 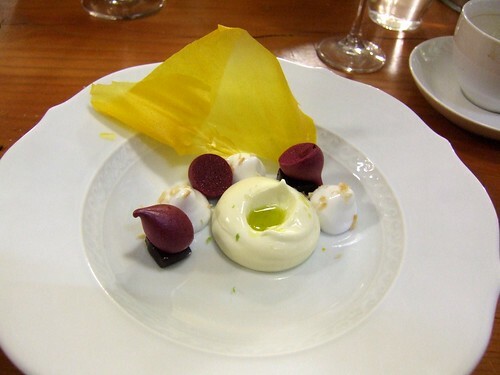 4 – A three-star dish that rivals Kinch’s Into the Vegetable Garden and Jeremy Fox’s Peas/White Chocolate/Macadamia – truly inspired territory. Thank you Michel Bras for your never-ending influence. 5 – You never saw my Sawada pictures from Tokyo? It was a Sunday afternoon, Tsukiji was closed, and Sawada-san pulled out a piece of aged tuna from his locker. Its taste was more irony than regular tuna, analogous to the difference between 28-day and 60-day beef. 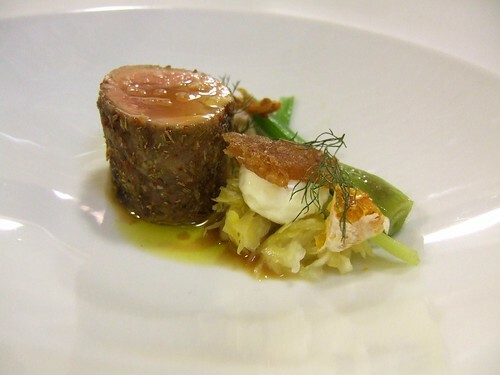 Aging tuna is also discussed in this Gastroville post – an amazing piece of writing. 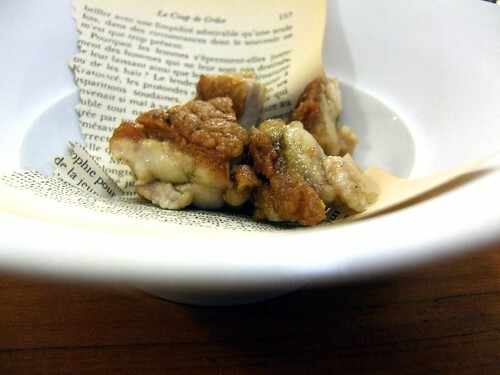 Wow, I need to get to sf soon, I am curious to know about the dish with the book/paper page on it, could you enlighten? I had a really well balanced menu there the other day. 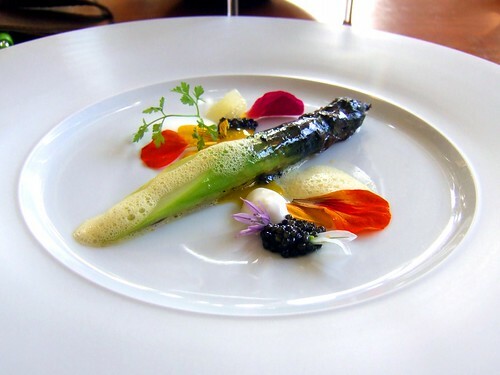 So nicely cooked and beautiful plates…. Good to hear about Saison Per – would love to hear more about your trip as it unfolds. My trip to the states was a real joy. My first visit in SF was great, had a good setup with restaurants and the somewhat european feeling of the city contrasted to that of the final stop in Chicago. In between we stopped for a some days in Napa/Sonoma. Sons and daughters, Prospect, Commonwealth, Benu, Saison, Yang sink, Slanted door, Flour + water, Ubuntu, Barbacco, Ubuntu, The French Laundry, The purple pig, Avenues, The Aviary, Next, Graham Elliot. Hard to pick the highligts, but if forced I have to say that I really enjoyed to finally have the oyster and pearls…. 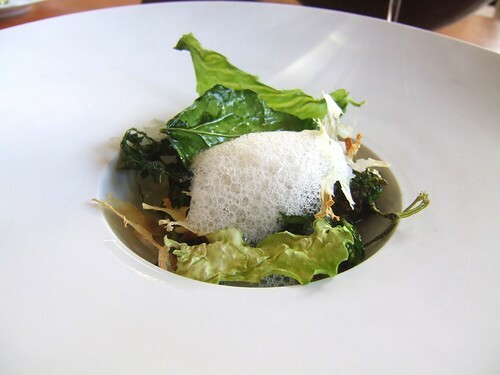 the false sharkfin soup at Benu, a fantastic truffle and chestnut dish at Avenues, the Brassicas at Saison…….Personally if I have to name a favorite place I might say Saison. First of all for the food and second for the people, I was a little bit lucky and got hold of a kitchentable seat and that might have made that extra little…. Avenues also made a real effort. Benu was really good but lacked a little in service before headsommelier Yunn showed some attention then it went on up…. Some of the food was really great some of the dishes in my opinion could have been skipped for a shorter but more intense experience. Napa and Sonoma with a visit to BOND Estates, meeting with Luc Morlet, Cathy Corison and Saintsbury was a wonderful first contact to this beautiful area. I will return! !